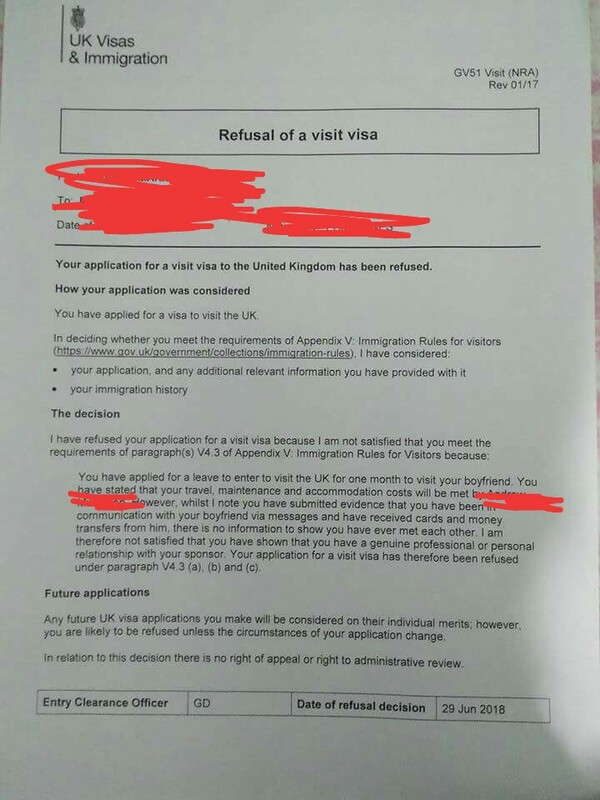 I am from the Philippines and I applied for a visit visa to visit my boyfriend who is a British citizen. We have been corresponding for more than a year and I have provided all our means of communications through Messenger, sent cards and receipts of money via Western Union. But I was refused because we have not met yet, which I mentioned in my cover letter, although I have not stated why. He has a fear of flying. Can he provide a medical certificate from his doctor regarding his problems about flying? Would that be enough to support my reapplication? Thanks! So from the ECO’s perspective, it may be hard to distinguish you from a naive young person who has been promised either by love or money to come overseas, and who will be promptly put to “work” in less than pleasant conditions for their sponsor while their passport is taken away from them. How can you counteract this suspicion? Mostly by having enough resources to live and travel on your own — and to have a long enough of an international travel record to back this up. As other already state well, from the immigration point of view, you are not and never will be in a relationship with someone you never met. That so is stated without any margin for doubts in the document you have shown us. I have a Philippine wife and often random people (or not so random) ask her for opinions and help about migrating/visiting. We have seen already several cases when even having a marriage promise, not following the established bureaucratic steps, and with records of previous visits, that the bride has seen her right of entry/visa refused. We also know of a couple of cases were couples had to marry in the Phillipines to solve their situation. I am afraid you might only be spending time and money coming on your own without precedents or verifiable ties. The right course of action seems to be your boyfriend visiting you, with the help of a doctor and medication to overcome his fears. Or as per the comments, meeting in a neutral country where you can gain entry easily. However, I suspect, for building a case for proving a relationship, it would work out better he visiting you at home. I agree with two options described by @Cannon Fodder. What would I do in such kind of situation? 1) I would reapply when my financial situation would change. I would try to save something from the salary, maybe to borrow of a certain amount of money from friends, to put it all on my bank account, and to wait for some times=. I would add a letter from my employer stating my salary and the bank statement to show that I have resources to support myself. 2) I would ask my BF to go to a doctor and to ask him for a reference concerning his fear. I am pretty sure the flight phobia could be certified if it is really a case. Then I would add this certificate to your application together with a letter from you describing the situation in detail. Not the answer you're looking for? Browse other questions tagged uk visa-refusals filipino-citizens or ask your own question.